November 2014 – …yours truly, Andiispice. Are your eyes full of logs? Or love? Je suis fatiguée. Oui. Yeah, I’m tired. Or rather, “ayam tayad”, in local yarn. But I promised myself I’d write something and post today. Hmm, now what am I gon’ write about? Okay, let me just share this. 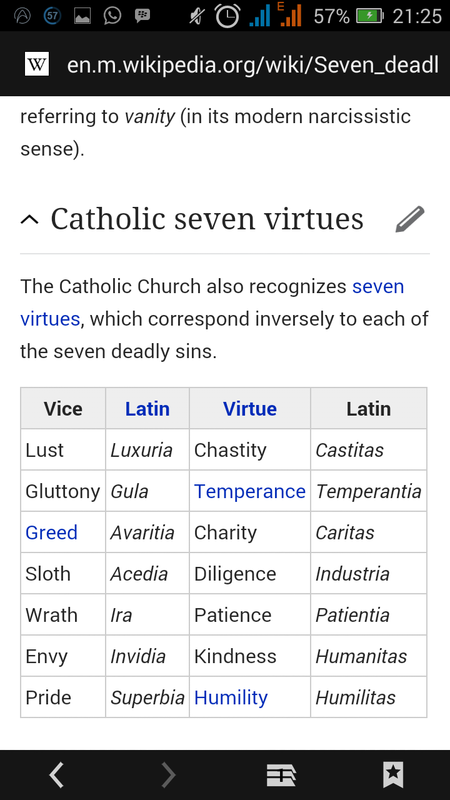 I was browsing stories on Wattpad, and there was one titled The Seven Deadly Sins, and as I read it, it hit me. 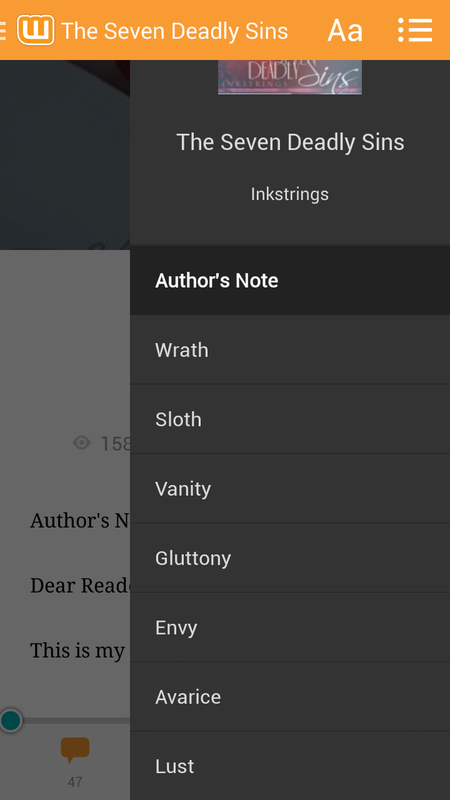 All this while I didn’t see myself as possessing a deadly sin, but here I was reading about sloth, and realising that I did stuff quite like that sometimes: lazying around all day when I should have been doing some writing or studying. (Yeah, I sha like book, lol). I had to do some reality check, and remind myself not to condemn people in my heart, especially when I was doing what they were guilty of. That’s not a love attitude, not at all. Thank God for the wisdom of the Holy Spirit that helps us make the right decisions in life. Thank God for the gift of His love. It’s funny how the specks are oh so visible in other people’s eyes when we look at them with our own eyes chock full of logs. Okay, enough talk about sins. Virtues nko? 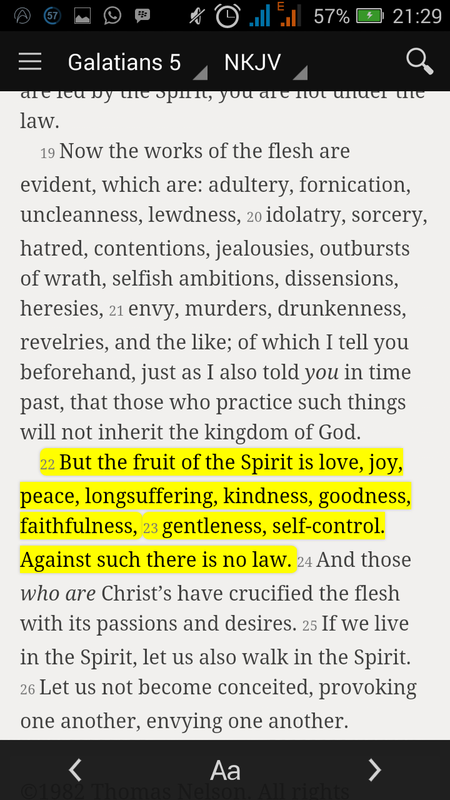 You can just go ahead and study Galatians 5 for the fruits of the Spirit. Quite interesting, I must say. You can never go wrong with God’s Word and His Spirit. Till very soon, see ya. Hey hey hey! I’m so super sorry I’ve been MIA here on the blog…loads of stuff to get sorted out, especially now that I’m in paid employment, and not lounging at home. (Gosh I miss those days…lol). … Okay, so I’ve been going to work, waking up pretty early, getting home late, and I’ve been in quite a lot of Danfo buses in dear ol’ LasGidi. And these buses…long, tall, short, wide, different shapes, one predominant colour: a shocking yellow so bright it leaves stars in your eyes the first time you see it in Lagos, numerous bright yellow buses clustered in the parks and on the roads in traffic jams, fighting for space to move just a few metres. The stuff I see written on these buses kinda let you know what the driver of the bus is about. So I decided to put up the ones I’ve seen so far. I used to write them down, thinking I’d keep them for my novel I’m working on. But I’ll just put them up now and keep updating the descriptions and photos as I see them. If you’ve see any others., please feel free to add them as you comment thanks. Okay, it’s time for me to close from work, and enter another danfo again on my way home…o wole ooo! You probably wonder why I’m writing about danfo buses and the drivers. This is because I realized that a lot of times we just use these buses to get to our destinations, and we’re too busy to think of these people as actual human beings, and wonder about their lives and their stories. I have also seen a lot while riding in buses, and while I’m working towards not needing a danfo to move from point A to point B, it’s quite interesting what happens in the buses and parks sometimes. So here am I, telling my story. Bless.